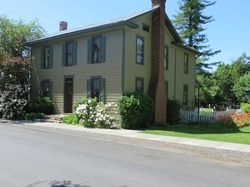 Built in 1825. Original use: cabinet maker’s shop. James Johnston Jr. was a cabinet maker and the original owner of the property. Colonel Johnston was also a prominent businessman in the young Village with many enterprises including the Boalsburg Tavern, and a sawmill. Items of note: The building’s first floor is constructed of hand hewn logs with wide, plank floors throughout. German, lap siding completes the exterior. A two story addition to the back of the building was added in 1994. The original log wall is exposed in the back and includes original windows.